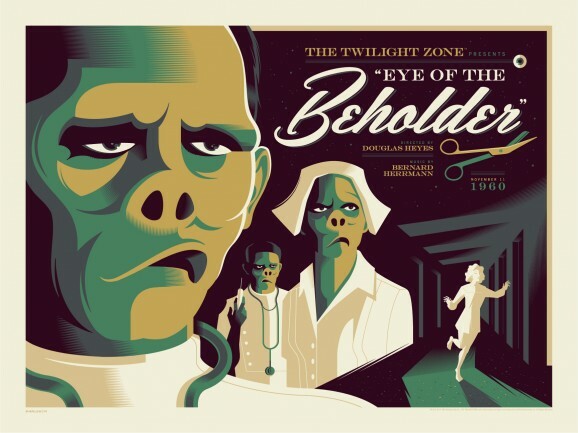 The Twilight Zone helped bring science fiction to the masses. Among other things, its creepy music and some of the visuals—William Shatner (and in the movie remake, John Lithgow) watching the creature on the wing of a plane sticks with me in particular—have become iconic, and have successfully resisted fading into oblivion or irrelevance, even in the era of CGI. Now, Dark Hall Mansion has released a limited edition print project honoring the landmark series. There are a lot of reasons to go to San Diego Comic-Con. Getting to see footage from all the hottest upcoming movies and TV shows. Maybe getting to meet some of your favorite celebrities and stage the perfect Instagram shot. The sheer spectacle of the massive Hall H presentations. But for collectors of various stripes, there’s one other irresistible bait: exclusives. 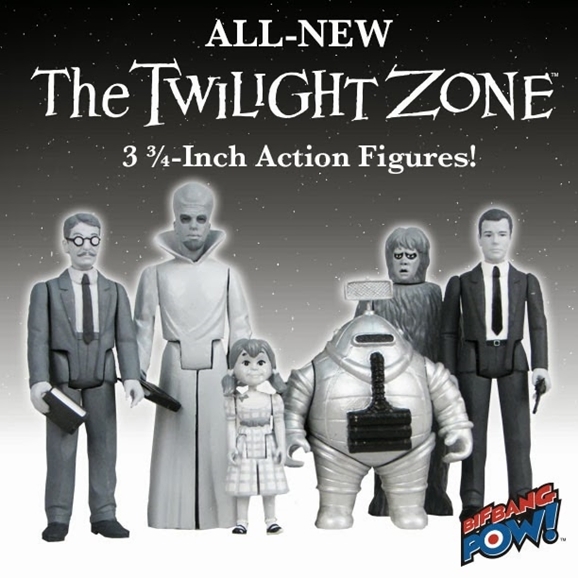 If you fall into that category, or you’re just a fan of Rod Serling’s classic The Twilight Zone, these exclusive action figures from Bif Bang Pow! and Entertainment Earth may well have you salivating. If you’re a regular GFR reader and these look familiar, it’s because we originally reported on these figures back in March — one version of them, anyway. That incarnation of them has them rendered in stark black and white, just as they originally appeared in Serling’s creepy creation. You can still pre-order those, and they’re due for release in August. These colorized versions will be available exclusively at the Entertainment Earth booth on the Comic-Con floor (booth #2343). Aside from the whole “exclusive” bragging rights, they’ll also let you reveal to all your friends that, whaddya know, that gremlin on the wing was green all along! Which doesn’t make it any less goofy looking, but there you are. Submitted for your approval: your average social media experience takes on a strange new reality as Rod Serling’s poltergeist starts sending you new Twilight Zone pitches in 180 words or less. These aren’t just recycled plotlines from Serling’s seminal science fiction series, mind you. No, these are entirely new twists on our modern world, a world of Instagram and Netflix and Starbucks lined up two or three per block. You are entering a world of The Modern Twilight Zone on Twitter, which is regularly serving up 21st century twists on Serling’s iconic anthology series. The Modern Twilight Zone Twitter has been up and running for several months now, and what’s interesting is that it’s not just the simple punchline farm you might expect. It would be easier to just parody the storytelling style and trademark twists of Serling’s beloved Zone, but TMTZ doesn’t seem to be interested in just going for the laughs. Some of the tweets are funny, but for the most part they are earnest attempts to imagine Zone-style stories grounded in the realities of modern day-to-day life. What spin would Serling have put on Facebook, for instance? 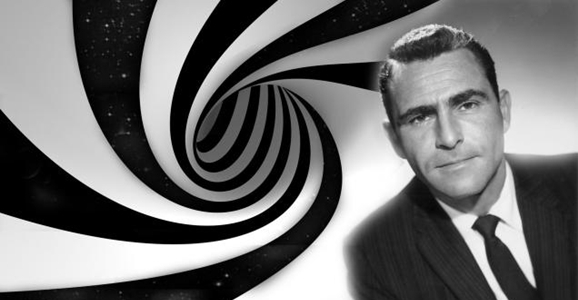 Rod Serling’s Twilight Zone has been through several incarnations over the years, some good (the ’80s revival that featured writers such as Babylon 5’s J. Michael Straczynski, Harlan Ellison, Farscape’s Rockne S. O’Bannon, and Game of Thrones’ George R.R. Martin) and some not so good (UPN’s 2002 version). There are new versions in development as we speak, one for television (from Bryan Singer) and one a movie, and there’s even a comic series (penned by none other than the aforementioned JMS). But regardless of how any of those turn out, this summer you’ll be able to take home the Zone in action-figure form. The Twilight Zone has been in the news a bit in recent months thanks to a feature film version that’s been in development for a while now, at one point set to be directed by Let Me In helmer Matt Reeves. The last we heard about that project was ‘lin November, when it was revealed that the flick would tell one story, rather than taking an anthology approach like the series and the 1983 film. Now some very exciting news reveals that the Twilight Zone will also be returning to its television roots, courtesy of Bryan Singer. The news comes by way of Deadline, who say Singer will be developing, executive producing, and possibly directing a new Twilight Zone series for CBS TV studios. While the project is still in the very early days, Singer and company are currently looking for a writer for the pilot. There’s no word yet what format the new TZ series will take. Will each episode be one self-contained story? Or maybe several shorter stories? Either way, we’ll definitely be keeping our eyes on this one. There have been a few incarnations of The Twilight Zone over the years, most recently the short-lived 2002 version aired on UPN and hosted by Forest Whitaker. There was a notable reboot in the mid ‘80s that enlisted the talents of folks such as Babylon 5’s J. Michael Straczynski, Farscape’s Rockne S. O’Bannon, Game of Thrones’ George R.R. Martin, and Harlan Ellison himself. Hopefully if this new TV version goes to series, they’ll follow in the earlier versions’ footsteps and hire some of the current era’s best genre writers to pitch in. While Americans around the country are celebrating their independence by grilling things and consuming lots of beer, the dapper, lab-coated guys and gals at CERN rocked the science landscape by announcing today that they may have finally found the Higgs Boson, the so-called “god particle.” Amongst the general populace, that news is likely to generate a question of “Who the hell is Higgs Boson?” But we like to think that our readers here at GFR are a savvier sort when it comes to science, even if we don’t all have degrees in particle physics. So even if you’ve read the articles and still aren’t entirely sure what a Higgs Boson is, we can all at least agree that this is a big day for capital-S Science. 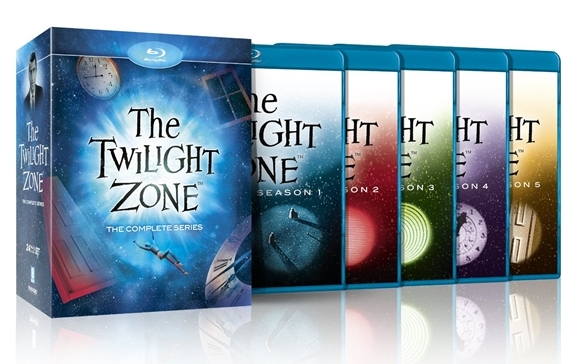 In honor of this titanic potential discovery, Amazon has decided to mark down one of the greatest science fiction series of all time: today only, you can pick up The Twilight Zone: The Complete Series on Blu-ray for $179.99, a savings of 55% off list price.